A Girlguiding Scotland leader has been named Scotland's Youth Worker of the Year 2018 for her work in empowering young girls and women in a small island community. Matilda Lomas has revived Girlguiding on Harris, an area where there was no provision for several years, giving local girls the opportunity to join with Girlguiding Scotland's 50,000 young members. Award organisers said that through her "dedication and vision for this remote community", local young girls now have access to international opportunities, while the many social action projects on the island have brought all parts of the community together. The 28-year-old was also presented with the National Community Youth Work Award at the award ceremony at the Crowne Plaza Hotel in Glasgow on Thursday evening. She said: "It's just amazing that I've come from the Isle of Harris down to Glasgow, which seems like a million miles away right now. "As a volunteer it's so special to be recognised for all the time and energy we give to young people. I feel the work Girlguiding Scotland can do on such a small island is so valuable, and it is particularly relevant this year, as we celebrate 100 years since the first women in the UK were given the vote." She was presented with the award by Deputy First Minister and Education Secretary John Swinney, who hosted the event. He said: "It is vital that all of Scotland's children and young people have a fair chance to flourish. Youth work makes a significant contribution to this: put simply, it helps change lives. "I am always humbled by stories from young people and practitioners which demonstrate the real life impact of youth work." The National Youth Work Awards 2018 is one of the events celebrating Scotland's first-ever Year of Young People. Other winners include Neil Young of St Paul's Youth Forum in the Provanmill area of Glasgow, whose mission to change the community earned him the title of National Inspirational Leader of the Year 2018. 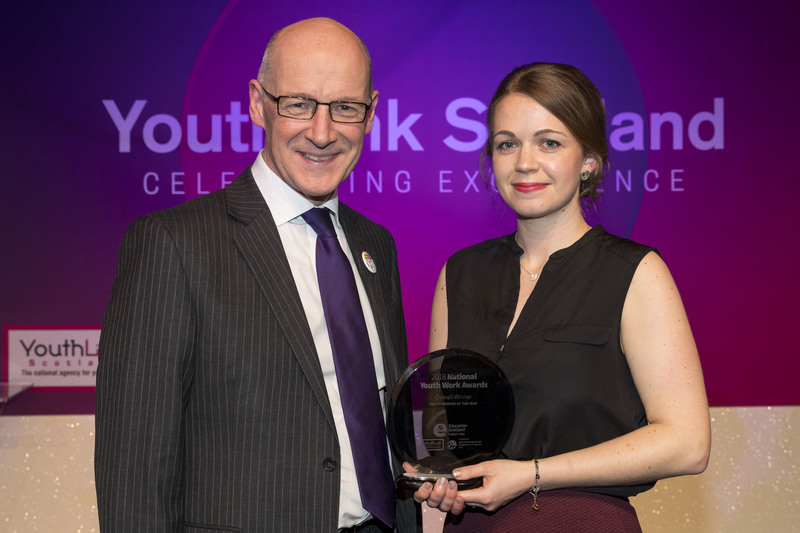 Katie Mackay, who works for the Prince's Trust in Springburn, Glasgow, picked up the National Supporting Attainment Award for getting young people back into education. YouthLink Scotland Chief Executive Jim Sweeney said: "This is the Year of Young People and the Awards are all about celebrating Scotland's 80,000 youth workers who support, nurture and inspire over 400,000 Scottish young people every year.